The Application of a Sea Water Chiller of Aquaculture water cooling is the most energy efficient way water cooled with titanium gasket heat exchanger evaporator for corrosion free life for many years of trouble free operation. We have a wide range of cooling fluid solution like ethylene glycol for chemical industry propylene glycol for food industry and also other fluid can be used directly in our exchanger Titanium is the only heat exchanger material proven to be 100% fish and coral safe in saltwater systems. The Scanair is built with an oversized helical titanium coil in the heat exchanger to maximize calories transfer efficiency. The quite internal spring mounted hermetically sealed compressor provides years of reliable service. Their low profile and compact design allows for easy placement in tight places. 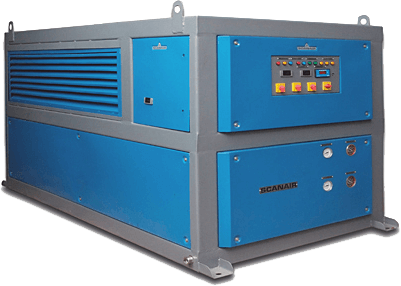 Scanair also manufacturers & suppliers in India heat pumps come in heat and heat and Cool versions a full range of capacities and models available depending on your application and needs aquaculture water heating is the most energy efficient way to heat up fresh or salt water you can heat up your pond for only minimum cost that other traditional methods might cost more. Each year we receive more and more requests and inquiries for heat pump applications in aquaculture. The benefits are many and your investment will pay back immediately in monthly savings versus gas or electric element heaters. The benefits are many and your investment will pay back immediately in monthly savings versus gas or electric element heaters. You will also have less to worry about because our recommended heat pumps have a titanium heat exchanger titanium being the safest metals to use in fresh or salt water applications to protect the aquatic life from the harmful components or metals like copper that most common heaters have we like digital display thermostats and quality scroll compressors with titanium heat exchangers all designed to keep the right temperature in warm and in cold weather these components will assure the long life and reliability of your equipment when sized properly your heat pump will provided a stable and constant temperature for your water pond. The heat pump operates by collecting the free heat from the air and moving it to the water using very little electricity to run the unit.